Just ten months after the devastating earthquake, Channel 4 News reports from cholera-hit Haiti as the country is put on high alert for Tropical Storm Tomas. Tropical storm Tomas is expected to hit Haiti today, unleashing a surge of floods up to nine feet high, putting some 1.5 million people in Haiti at risk. The United Nations has warned the likelihood of severe flooding will threaten spreading a deadly cholera epidemic which has already claimed hundreds of lives. The Pan American Health Organisation has told Channel 4 News some 442 people, (249 in hospitals, 193 in the communities) have been killed by the cholera outbreak. They said 6,742 have been hospitalised. Nigel Fisher the UN humanitarian coordinator in Haiti warned: “The biggest fear is people being caught by high waters and the potential spread of cholera. The outbreak of the diarrheal disease triggered another national emergency in one of the poorest nations in the world. This came just months after a deadly earthquake struck the country at the start of the year in January. More than a quarter of a million people were killed by the quake, but the survivors face another struggle to stay alive as some 1.3 million are now living in makeshift tented camps following the January quake. There is also a hurricane watch for the southeastern Bahamas, the Turks and Caicos Islands. Tomas hit the Caribbean’s eastern islands as a hurricane four days ago, killing five people in St Lucia before weakening. But it is gaining momentum again and is expected to crash into Haiti and Jamaica. The fear is that Tomas will now reach hurricane strength again and smash into multiple regions at the same time, thus making it difficult for the government and aid agencies to cope. Julie Schindall has been working for Oxfam since March and is currently based in the outdoor camp in the suburbs of Port-au-Prince at Petionville Golf Course. She told Channel 4 News the first priority is to make sure water sanitation structures put in place after January's quake are safe and secure. She said: "We are all preparing for the storm as quick as we can. It's a busy time. We have three emergencies at once, the cholera response, the quake response and now the storm. "It will be very challenging; this is what we do as humanitarian agencies. But the fact we have three emergencies we are stretched to the max. That's in terms of supplies, staffing and funding nationwide. 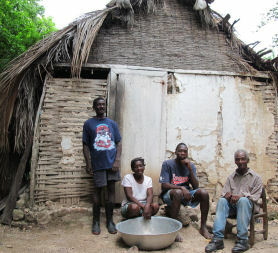 "Oxfam began preparing for the hurricane season for months. They strike every year, so we wanted to try and make sure water sanitation structures are strong and stay in place. We are prepared to repair any structures damaged by the storm. There's half a million people we're helping already and we need to educate them through the water sanitation and water hygiene programme. "The clear problem we have is that people are living outside, so we need to make sure we can do reconstruction and in the long-term we need to be able to support the Haitian government to protect its people with adequate infrastructure and disaster response year-on-year. "The link between any kind of storm and the risk of cholera is that of standing water, which propagates diseases. This is a very big concern. And that's why we are going around all of the camp today, making sure that water sanitation structures are strong, water bladders tied down and latrines are cleaned. "We have community mobilisers going around to make sure everyone knows about good hygiene. Everyday we're seeing small isolated villages with people asking ‘what is cholera?' We need to make sure they have clean water and understand that it's the first line of defence against water borne disease." Authorities in Jamaica are trying to prepare shelters and are urging people to evacuate from low-lying areas. In Haiti the government is urging people from low-lying areas to evacuate to higher ground if they can. But the capacity for the government to speed up and evacuation is limited as hundreds of thousands of people will find it difficult to pile into the already cramped makeshift camps. Emma Le Beau is working for Medair on the south coast of Haiti in a place called Jacmel. She told Channel 4 News that the people living in camps or damaged homes already will need immediate help in getting appropriate shelter once the hurricane hits. But she is concerned the storm will compound the vulnerability of this already poor nation. She said: “Since the quake we have been trying to get people into shelter. We knew hurricanes were always going to be a threat. 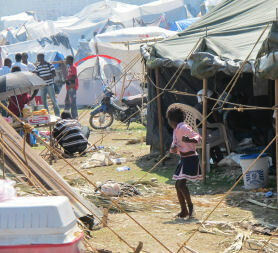 In Jacmel there are around 10,000 people who will need help, up to 2,500 of these living in camps. “We have a transitional shelter plan in place which is an internationally recognised solution for emergency large scale housing. These are shelters that can be moved from site to site and even upgraded into better shelters. Medair has managed to put into place 1,400 shelters in the Jacmel area, housing around 8,500 people, but now the hurricane is on its way there are still people remaining in houses that are still damaged from the quake and they are very vulnerable. 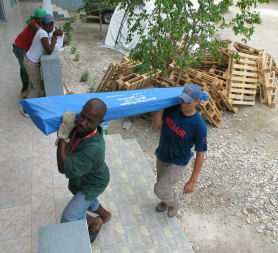 One resident in Jacmel Medair has helped is Fritz. He and his wife have a small enterprise making banana chips and potato chips. He said: "Me and my wife we make both sweet and salt banana chips, we've been doing this for 20 years. In the past there have lost everything because of hurricanes and flooding, especially when Hurricane Gordon came here in 1994 we lost everything. All our baskets and cooking pots we had to buy again to start earning money again. Thankfully these items were not destroyed in the earthquake, I am so relieved. But flooding carries things away. I don't want to loose them again." Emma Le Beau told Channel 4 News Medair has been concentrating on messaging the area of Jacmel and stocking up emergency shelters. She said: “In terms of what we’ve been doing: we’ve been supporting the messaging through our Medair community mobilisers. This has been put into action by doing house-to-house visits to explain to people what they need to do to prepare. The second thing is continuing pre-stocks of emergency shelters. We fully anticipate to recommence the transitional shelter programme after the hurricane. But we are aware there will be people in immediate need of help who don’t have shelter. For these people we have emergency shelter in warehouses. “Thankfully the cholera outbreak hasn’t reached us, but we are prepared for it as there’s a high risk of an outbreak. What Medair can do is help provide temporary hospitals and clinics. He added the UN immediately needs around 150,000 tents and tarpaulins to provide additional shelter. 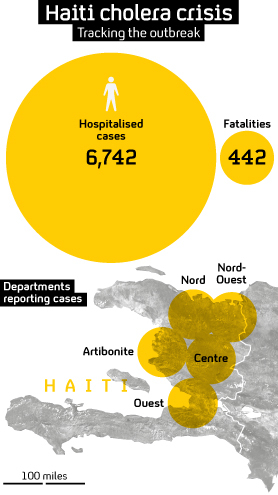 With the storm threat and the spreading epidemic, Haiti faces major disruption less than a month before 28 November presidential and legislative elections. Electoral officials have not moved to postpone the vote. Poor Haiti. Spawned by imperialists, reduced by earthquake, sickened by cholera, and now "le deluge", writes Jon Snow from Haiti. I'm writing ahead of it because I won't be able to Snowblog during it. Depending which satellite imagery you go with, by dawn our time, midday in Europe, whatever force will strike this island will have struck, or be striking, or be about to strike.